If you are a bit overwhelmed by all the types and varieties of videotape available, here is a brief overview of the most common videotapes used in consumer video electronics. We will divide tapes into two categories – analog video tape and digital video tape. Mini-DV Tapes are used with certain digital camcorders, and are the smallest of all the formats available. 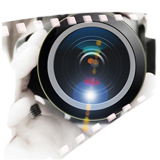 They can capture great quality images because of the digital format, and digital formats can be copied over and over without losing image quality. Mini-DV tape is available in 30, 60, 63 and 80 minute lengths. DIGITAL8 is a digital format recorded on Hi-8 and 8mm cassette tapes. You don’t need to buy special tapes to record on a Digital8 camcorder – you can use Hi-8 and 8mm tapes. However, it will use the tape twice as fast. A 2 hour Hi-8 tape will only last 60 minutes in a Digital8 camcorder. One great advantage of a Digital8 camcorder is that is can also play your analog 8mm and Hi-8 tapes as well. VHS tapes are played in standard VCRs. They are the ones most of us are familiar with, and most of us probably still have quite a few around. Blank tapes could be used to record home movies or television programs, and VHS was also that standard format for produced content (like movies) for decades. 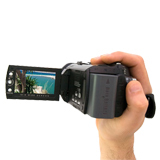 Camcorders also initially used VHS tapes, but quickly transitioned to a smaller format. VHS provided good resolution when recorded and played back at the 2 hour speed (SP). However, it could also record 4 hours (LP) and 6 hours (SLP) at a significant reduction in quality. Super VHS or S-VHS is a VHS size format that has improved resolution. While this format never became common in the consumer market, it was very popular with professionals. Like VHS, it has widely been replaced with digital formats. A VCR has to be S-VHS capable in order to play the enhanced quality. S-VHS tapes will not play on standard VCRs. VHS-C tapes contain VHS style tape – but with less tape and a smaller cartridge than standard VHS tapes. This was one way to reduce the size of a camcorder and still have a tape that could play on a standard VCR when the VHS-C was put into an adapter (that usually came with a VHS-C camcorder). 8mm camcorders and tapes were introduced shortly after VHS camcorders were put on the market. The size of a camcorder needed to accommodate a standard VHS tape was just too bulky, so smaller tape cartridges were developed to use with a camcorder. Of course, the draw back was that the 8mm tapes could not be played on VHS players. The tapes had to played using the camcorder or they had to be copied to VHS. Most 8mm tapes record 2 hours of video. Hi-8 is a high quality 8mm analog video tape for Hi-8 capable camcorders. It has improved video quality over regular 8mm as well as hi-fi stereo sound. It may not be digital quality, but Hi-8 provides an excellent video picture. While some resolution may be lost when copying to regular VHS, most of quality will be retained when copying to a DVD. Hi-8 tape comes in 30, 60, and 120-minute lengths. ¾” Video Tape is a very early version of video tape used before the introduction of VHS. It may still be used by some videographers and 3/4″ decks are can be found in many professional duplicating houses. The quality is very good, but it could not compete with the convenience of VHS. BetaCam was introduced in 1982 by Sony for professional broadcast and film industry use. It provides superior quality to common consumer formats, with vibrant colors and a sharp picture. The excellent quality was not due only to the enhanced tape format, but also to the excellent quality of the professional equipment and operators that employed Betacam. BetaCam cassettes are large with a 90 minute cassette measuring 5.5” by 10” (14 cm by 25 cm). However, field cameras could use a smaller version that was 4” by 6” (10 cm by 16 cm) that usually held 30 minutes of tape. BetaCam SP is a version of Betacam that uses a metal tape to improve long term viability for storage and durability for reuse. Betamax Tapes were the consumer version of Beta. The quality was superior to VHS, but Sony elected to be the sole producer of Betamax instead of licensing the technology to other manufacturers. So prices of VHS players fell rapidly during the critical initial period of home video use, and VHS quickly saturated the new market, leaving Betamax to go the way of the dinosaur. However, Betamax had (or has) its loyal fans. You can probably still find some Betamax machines for sale if you shop around. That’s a run down on most common videotape formats. If you have ever confused by format terms that get tossed around, hopefully we have helped clarify what they are and how they are used.